As much as we might prefer to think that the internet just happens, the fact is that it comprises a massive physical infrastructure. In an exclusive excerpt from his new book Tubes, Andrew Blum takes us on a tour of the internet's most important US hideout. This is an exclusive excerpt from Tubes: A Journey to the centre of the Internet by Andrew Blum, published today by Ecco, an imprint of HarperCollins. 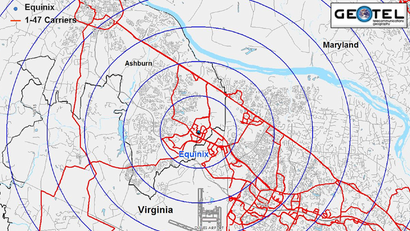 Ashburn, Virginia is a small town that Internet people think of as a giant city. They toss around "Ashburn" as if it were London or Tokyo, and often in the same sentence. The reason why lies behind an Embassy Suites hotel in an unmarked complex of buildings owned by a company called Equinix. The Internet works because every network is connected, somehow, to every other. Where do those connections physically happen? More than anywhere else in America, the answer is "Ashburn." This is the bullseye of America's Internet. On the hot June day I visited, a maintenance worker wearing a surgical mask swept the empty sidewalk. Jetliners buzzed by low overhead. Heavy-duty power lines hemmed in the horizon. I saw no proper entrance to speak of and no signs, only blank steel doors that looked like fire exits. But the parking lot was full, and I followed a guy into the security lobby of what turned out to be the wrong building. When I finally found Dave Morgan, the director of operations for the complex, he saw no reason to apologise. On the contrary, confusion was his goal: customers are reassured by the anonymity of the place "except maybe on their first visit." Then he shared a handy tip for the next time I found myself similarly lost on the way to the Internet: look for the door with the ashtray next to it. I passed through three layers of security-biometric scanner, man-trap, steel mesh wall-and then it was like stepping into a machine, all rush and whir. The high ceiling was painted black, like a theatre, and disappeared in the dimness. I faced a long aisle lined with darkened cages, each with a handprint scanner by the door. Blue spotlights created a repeating pattern of soft glowing orbs. "It's a bit like Vegas," my guide, a "recovering network engineer" named Eric Troyer, said, "no day or night." Equinix's customers are network operators of all sizes, from Verizon to Telecom Malaysia, Facebook to Wikipedia. They rent space here, ranging from a single rack to an apartment-sized suite. Some will ship their equipment ahead and pay to have it "racked and stacked." Others, affectionately known as "server huggers," spend their days here. "They're locals, like Norm in Cheers, pulling up his bar stool," Troyer said, nodding in the direction of a large guy in jeans and a black T-shirt. "But this is not a resort destination." Equinix Ashburn isn't a warehouse for data. It's a distribution depot, mostly occupied by networking equipment: machines in the exclusive business of negotiating with other machines. A company like Facebook, eBay, or a large bank will have its own data centre in the boonies-somewhere electric power is cheap and there's fibre in the ground. Then it will tether in here, spraying its data out from its own cage to the cages of Internet service providers and backbone networks. (This is exactly what Facebook does.) The heavy-duty storage happens elsewhere; the wheeling and dealing-the actual exchange of bits-happens here. The Internet doesn't make itself. It is built on connections between networks agreed on with a handshake and consummated with the plugging in of a yellow fiber-optic cable. Technically, those connections could happen across any distance. But it's more efficient to do it directly, plugging my box into your box, in an exponentially repeating pattern. Equinix Ashburn satisfies that basic economic and technical desire: it is cheaper and easier to connect two networks directly than to rely on a third network to do it for you. When two networks want to connect to each other, they'll request a "cross-connect," and an Equinix technician will climb a ladder and unspool a yellow fiber-optic cable from one cage to the other. Laying cables is something of an art form, with different types placed at different layers, like a data centre mille-feuille. The oldest cables are on the bottom of the pile. "It's almost like an ice core," Troyer said. "As you dig down you're going to see sediment from certain time periods." Given the monthly fee Equinix charges for each "cross-connect," this is the bread and butter of the business. The bean counters see each one as monthly recurring revenue. The network engineers see vectors. The data centre techs see the sore back they'll get reaching up to the racks to run the cables. But in the most tangible way possible, these cables, and this building, are the Inter in Internet: the space in between. 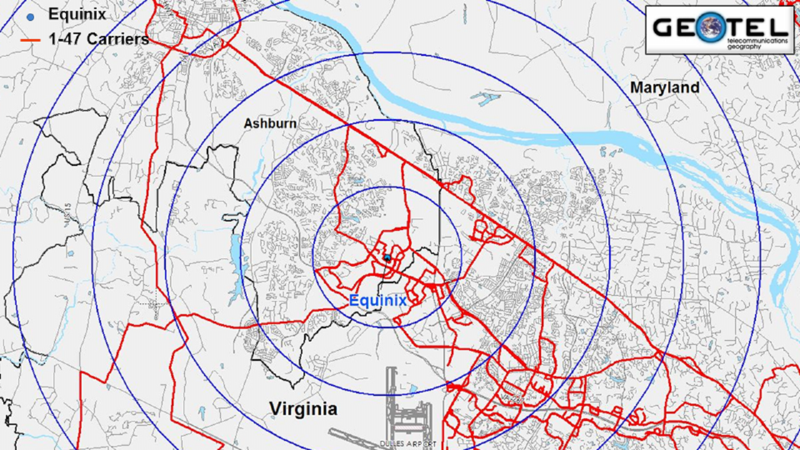 Equinix Ashburn is the extreme logical opposite of the Internet's standard proposition: if most days we count on the Internet to let us be anywhere, this is the place where the Internet connects to the earth. It is the seam between the global brain and the geologic crust.